This morning a little after 8:00 a.m. Eastern Time, Google Apps went down. I received a text message from a client that they couldn't access their email. After a few minutes, I discovered that Google Apps or Google Mail was down. "Cannot Get Mail" The user name or password for "user@domain.com"is incorrect. Or, when they tried to login to their mail via their web browser, the message received was: "502. That's an error. The service encountered a temporary error and could not complete your request." or the other message below. Like many other Webmasters, I took to Twitter to find out what's going on. Despite Google promising 99.9% Uptime Guarantee for those of my clients that have a paid plan, the Google Enterprise Support Number 1-877-355-5787 was busy. The first thing Twitter users pointed out was that the Google Apps Status Dashboard did not display the Service Disruption. After more than 30 minutes of downtime, there was no indication that Google was acknowledging the Outage. However, by the number of tweets, you could easily see the severity of the outage. When these outages occur, the first question many of my clients usually ask is if any email will be lost. That prompted me to send a test message to myself to see if Google was able to receive mail during this period and if they will hold it their queue for later delivery. More on that later. Eventually, the Google Apps Status Dashboard was updated and I learned for the first time that Google was acknowledging a "partial" Service Disruption. This was for Google Mail, Google Drive, Google Documents, Google Spreadsheets, Google Presentations and for Admin Control Panel / API. The problem with an outage like this one is that most users immediately think that the problem or issue is with their computer, their email client or their password. Since Gmail or mail was still working for their personal account and Google Apps Mail rarely goes down, they think it might be something they did. The error message in this case "the user name or password is incorrect" is certainly deceptive or misleading. In addition, between 8 a.m. and 9:30 a.m. Eastern Time is probably the worst time of the day to have this type of a issue. You could also see that the webmasters in the Twitter Community were starting to get anxious about the length of the downtime, with no detailed official word from Google. On or around 9:30 a.m., after almost 90 minutes of downtime, I noticed from a Google Support Forum that users were reporting that their service was back up and running. When I checked my email, I saw email with the correct time stamps (between 8 a.m. and 9 a.m. ET) started to arrive in my inbox including the test email I sent to myself. 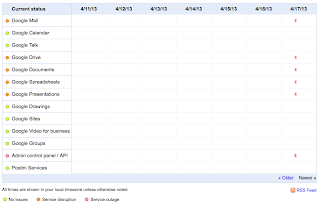 Finally, I also took the time to review the Google Apps Guaranteed Uptime. It was 99.9%, which means that even after 90 minutes of downtime, this was still in the acceptable level. If you do the math, even though their service was only up 94.75% today, 99.9% per year uptime would be 8 hours, 45 minutes and 20 seconds of downtime per year. 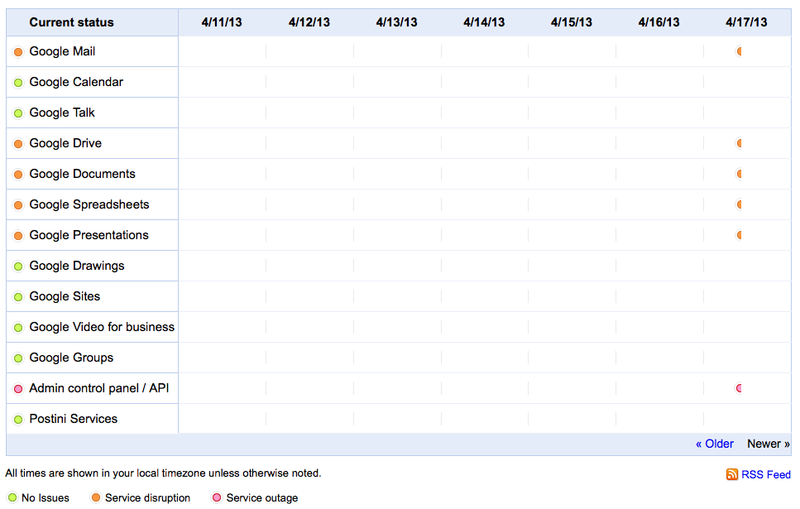 Google Apps still has over 7 hours of downtime this year to stay under the 99.9% threshold. Luckily, that's unlikely and when reading tweets from earlier this month, like the one below, I'm still a big fan of Google Apps. For information on my company's products and services, visit www.OgawaDesign.com.